An electric torque wrench is a planetary torque multiplier or a "Gearbox" mated to an electric motor. At the end of the "gearbox" is a reaction device that is used to absorb the torque. 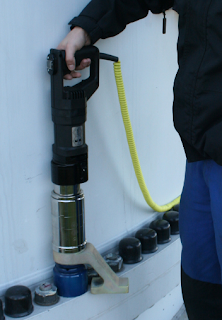 This allows the operator of the tool to use the electric torque wrench with very little effort. These tools are primarily used anywhere accurate torque is required on a nut and bolt, or where a stubborn nut needs to be removed. JUWEL-electrical power screwdrivers from the standard series TES, TEWS and TESM are highly compact Electrical power screwdrivers that are highly valued around the world for their robustness and reliability. 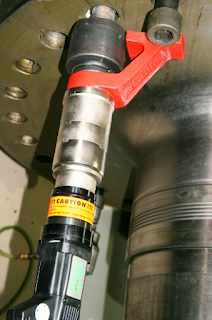 The units are used where high tightening and loosening torques are required, e.g. in steel construction, crane assembly, power plant and generator construction. 11.Devices available in 230 Volt and 110 Volt versions. 13.Right- and left-ward rotation and a 2-step gear; adjustable with 200 torque settings. 15.Can optionally be either with a load release. 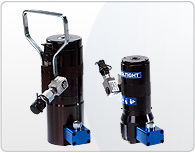 This leads to independent loosening of the torsion between the push-on socket and the support. The drive motor briefly turns into the opposite direction for this. This option is indispensable for short assembly times and offers best work safety. It is used in Multiple applications & sector like infrastructure. 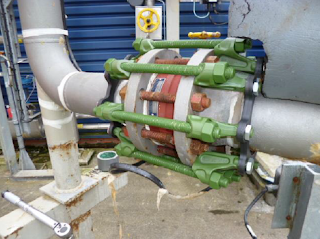 Xtegrity™, The Equalizer™ Flange Integrity System is a world first, providing a unique solution to the industry-wide issue of heavily corroded or degraded bolts within flange joints. Xtegrity™ is applicable to those concerned with flange maintenance or integrity issues. 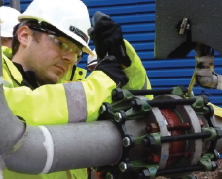 In scenarios where bolts are heavily corroded, there can be uncertainty about true bolt strengths and operators are faced with choices over hot bolting or shutdown or postponing the decision on how they will address the issue. This problem now has a solution in the form of Xtegrity™ which provides a means of restoring the flange joint integrity back to its original state in a safe, efficient and cost effective manner. 1.Many bolted joints are operating beyond their design life. 2.Carbon Steel bolts are heavily corroded. 5.Shut down and replacement is a substantial task and results in a major loss of production. 6.Budgeting for traditional bolt replacement is almost impossible. 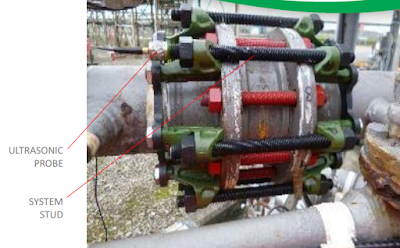 Xtegrity™ takes away the need to remove corroded bolts by "replacing" them with a new set of bolts which clamp round the outside of the flange and are then held in place by a floating frame. It can therefore replicate the same bolt size, quantity and specification used during the initial flange joint assembly. Installation of the system is simple and quick, with a typical four bolt flange joint taking less than one hour to set-up. 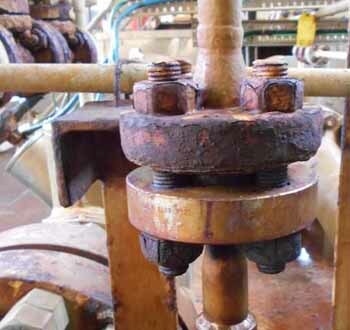 Taking away the need to remove old bolts also reduces the risk of flange joint leakage. 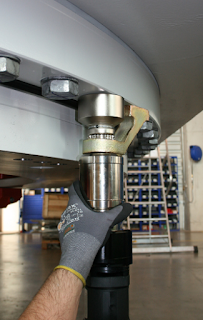 The system can be used on carbon or stainless steel, duplex or cunifer flange joints. Xtegrity has significant operational and commercial benefits. It can be used in situations where alternative solutions cannot be used, for example on high pressure, larger diameter flange joints. In these circumstances the only current solution is to carry out maintenance during shutdown resulting in potential loss of production and revenue. 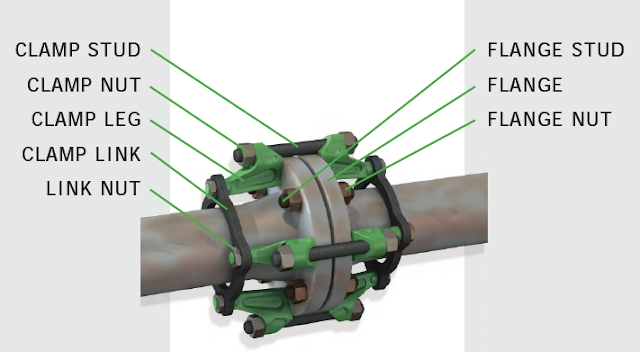 By effectively providing a 'replacement' set of bolts around the flange joint it also provides peace of mind to integrity engineers about the reliability of their bolted joints. Leave the corroded flange bolts in place and apply the Flange Integrity System to prevent joint failure. In the event of flange stud failure, the load will transfer to the Xtegrity system maintaining joint integrity • A “temporary repair” maintaining flange joint integrity until corroded bolts can be replaced. Temporary application to enable the corroded flange bolts to be replaced via hot bolting. • Xtegrity geometry maximises access to the flange bolt for maintenance tools. 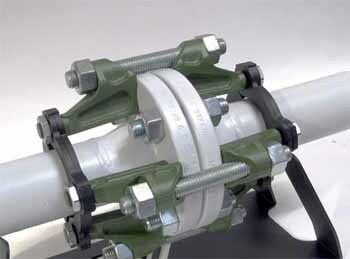 Tensioning is the direct axial stretching of the bolt to achieve preload. Inaccuracies created through friction are eliminated. Massive mechanical effort to create torque is replaced with simple hydraulic pressure. 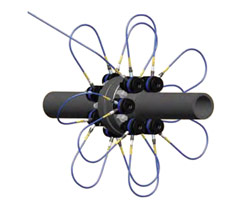 A uniform load can be applied by tensioning multiple studs simultaneously. Tensioning requires longer bolts, and a seating area on the assembly around the nut. 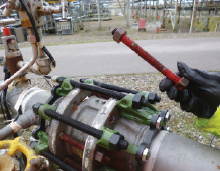 Tensioning can be done using detachable Bolt Tensioners or Hydraulic Nuts. Load loss is a loss of bolt elongation depending on factors such as thread deflections, radial expansion of the nut, and embedding of the nut into the contact area of the joint. Load loss is accounted for in calculation and is added to the preload value to determine the initial Applied Load. The preload depends on Applied Load and Load Loss (load loss factor). Manufacturer's rating of pressure and load are maximum safe limits. Good practice encourages using only 80% of these ratings! 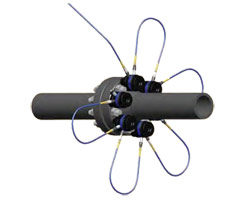 Tensioning permits the simultaneous tightening of multiple bolts; the tools are connected in sequence via a high-pressure hose assembly to a single pump unit. 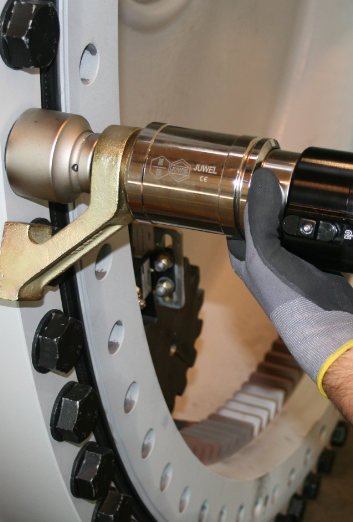 This ensures each tool develops the exact same load and provides a uniform clamping force across the joint. This is especially important for pressure containing vessels requiring even gasket compression to affect a seal. 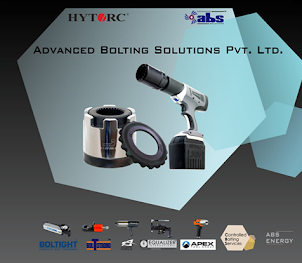 The bolt behaves like a spring, when the pressure is released the bolt is under tension and attempts to contract, creating the required clamping force across the joint. Not all applications allow for the simultaneous fit of a tensioning device on each bolt, in these cases at least two tensioning pressures are applied. This is to account for a load loss in those bolts already tensioned as the next sets are tightened. The load losses are accounted for in calculation and a higher load is applied to allow the first sets to relax back to the target preload. All bolts are tensioned simultaneously.